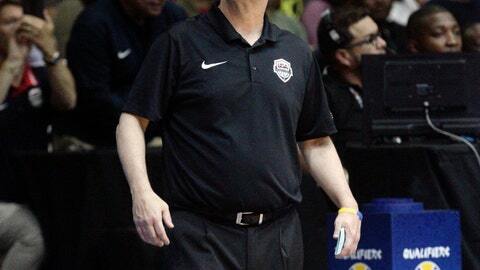 The challenge that Jeff Van Gundy accepted 16 months ago was a daunting one: Take a group of G League players, and turn them into a team that would be good enough to earn USA Basketball a spot in next year’s FIBA World Cup. Van Gundy hasn’t had one team for World Cup qualifying — he’s basically had five different teams, the U.S. roster changing so significantly from one round to the next that he’s had to essentially start from scratch every time. He’s made it work, and the U.S. will play at Argentina on Thursday night knowing that the job of clinching that World Cup berth is now finally within reach. Of the 12 players Van Gundy has with him on this trip — the Americans play at Uruguay on Sunday — only three have been part of any of the previous eight qualifying games. He’s now had 46 different players with him at various times during qualifying, and most of them have played in no more than two games to this point. Hearn’s efforts haven’t gone unnoticed. He was announced Wednesday as USA Basketball’s male athlete of the year, joining a group that in the past has included Michael Jordan, LeBron James, Shaquille O’Neal, Kevin Durant, Tim Duncan and the 1992 and 2008 Olympic teams. “Just to see that I’m included amongst that group is an incredible honor and something I never thought I’d be able to experience,” Hearn said. The U.S. gathered for some practices in Houston before flying to Argentina, and players are aware that two wins on this trip — regardless of any other outcome — would clinch the World Cup berth. The U.S. has used G League players throughout this process because the qualifying schedule — by FIBA design — conflicts with the NBA season. If the Americans reach the World Cup, Gregg Popovich would coach the team and his roster would be filled by NBA stars.